At ACNS 2011, Wu and Zhang proposed a new lightweight block cipher which is named LBlock. The design rationale of LBlock considers the trade-offs between security against cryptanalyses and performance in low-resource implementations. 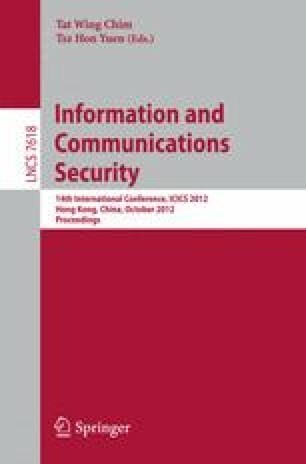 In this paper, we present new attacks on reduced-round LBlock using related-key differential cryptanalysis. Firstly, we construct a new related-key boomerang distinguishing attack on 16-round LBlock. Secondly, we construct a key recovery attack on 22-round LBlock based on a 16-round related-key truncated differential. In contrast to the published cryptanalysis results of reduced-round LBlock, our attacks have advantages on data and computational complexities. The authors are supported by NSFC 61100201 and Foundation for distinguished Young Talents in Higher Education of Guangdong (LYM11053), China.